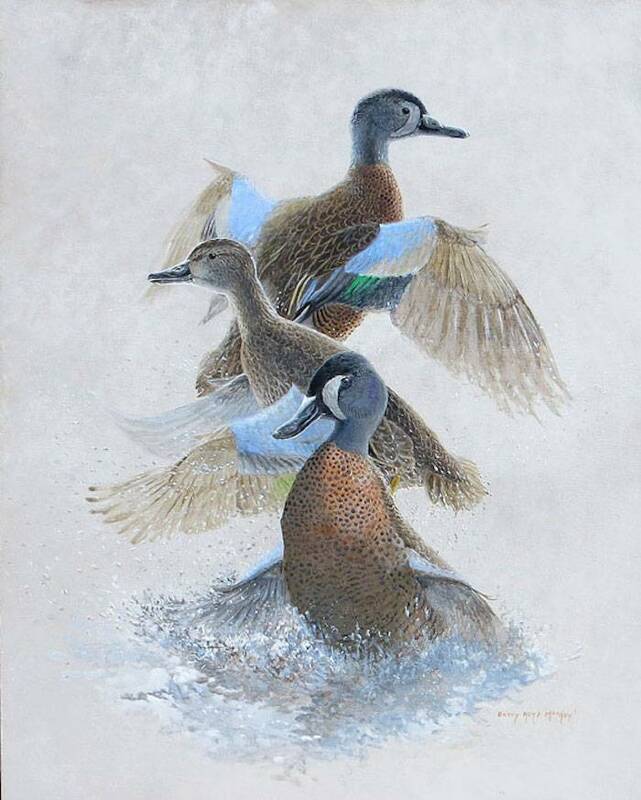 I love painting covers and frontispieces for journals and other publications about birds and this is just such a painting showing a perky little duck, the Blue-winged Teal. It is found as a nesting species from Alaska east to Nova Scotia, and south through much of Canada and the U.S., particularly in the interior. It belongs to a group of species that share various features and are collectively called “pond ducks” or “dabbling ducks” (as opposed to “diving ducks” and “sea ducks”). One of those features is the ability to spring up out of the water, as I have shown these birds, two males and a female, doing. Diving ducks tend to flap and run along the surface of the water, getting airborne less quickly. 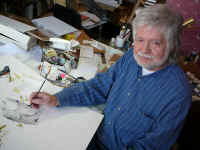 This image is to be used as a cover for the 100th anniversary issue of Ontario Birds. We wanted something that related to one of the articles inside (about native ducks) but also symbolized the enthusiastic upward, onward thrust of the Ontario Field Ornithologists, which publishes the journal quarterly. I kept it simple to allow room for print around the images, and somewhat backlit to make to be more dramatic, while blurring the wings and softening the outlines and features to suggest motion. These ducks nest in ponds, marshes and sloughs, are very closely related to neighbouring Cinnamon Teal (A. cyanoptera) and Northern Shovelers (A. clypeata), with all three species occurring in the prairies, and all three having very similar, nearly identical, wing patterns and female plumages, although the adult males are strikingly different in their respective breeding plumages. The differences tend to blur a little when you look some other species of shoveler from other parts of the globe, especially the Cape Shoveler (A. smithii) of southern Africa, in which the breeding plumage male seems to have a blend of colours and markings from the three North American species (although the Northern Shoveler is also well-distributed in Eurasia, with some wintering in Africa, and the Cinnamon Teal’s range extends deep into South America). Where I live, in southern Ontario near the north shore of Lake Ontario, the Blue-winged Teal is the most commonly encountered, and they nest near where I live. We also see Northern Shovelers but the Cinnamon Teal is a great rarity this far east. In winter Blue-winged Teal migrate into the southern U.S., Mexico and Central America and the West Indies, and into the northern half of South America. They are small, weighing from about 270 to 410 grams (9 and a half to 14 and half ounces). They nest on the ground, the nest typically very well hidden amid thick vegetation, often under a willow or other shrub, and they lay about 8 to 11 eggs that take three to four weeks to hatch. Typical of the “dabblers” they feed on or near the surface, sometimes “tipping up” but rarely diving. While they nest in fresh water wetlands, during migration and, especially winter, they may sometimes be encountered in brackish, or even salt, water, including amid mangroves. Although this is one of my favourite ducks, I this is the first painting I’ve done of them in decades and it is in acrylic on birch plywood mounted on a basswood frame. The size is 30 X 24 inches, with the birds portrayed slightly larger than life-size.